Flaky, delicious pastry, filled with sweet melt in your mouth butternut squash, deep green earthy kale & crunchy almonds. Only 6 ingredients and the pastry can be made in minutes in a food processor! 210g | 1 cup coconut oil , hard & refined, If your coconut oil is soft then put in the fridge for a little while before you need it. Place your pie dish in the fridge. ( I used a large pie dish measuring 25.5 cm wide and 5.7 cm deep). Add the flour, oil and salt to a food processor and process for a minute or two until well combined. Gradually add the water until you have a smooth pliable dough. Check it by feeling it. If you do not have a food processor then add the flour, salt and oil to a bowl and rub the oil into the flour with your fingertips until your mixture resembles bread crumbs. Gradually add the water, stirring with a knife then use hands to form into a ball. You do not need to refrigerate this pastry before rolling unless it is very hot in your kitchen. When it gets cold it gets very hard and difficult to roll so it is easier to do when it is at room temperature. Split the dough in half. Roll out one half to about 3-4 mm thick and line your pie dish. I did not blind bake my pastry as I know that my pie dish radiates the heat well and I don't tend to get soggy bottoms with dryish pie fillings but if you at all unsure I would advise blind baking. There is nothing worse than a soggy bottom! To blind bake line the pastry with a sheet of baking parchment ( to make it fit inside more easily screw it up into a ball then pull part before lining the pastry. Fill the pie dish and parchment paper with baking beans , rice or dried beans. Bake for 10 minutes. Remove from oven and gently lift out parchment paper and beans. 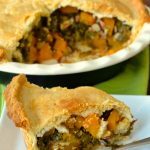 Fill pie with butternut squash, kale and onion then sprinkle with almonds. Roll out the remaining half of pastry. Brush the sides of the pie bottom with non dairy milk then lay the top gently across. Press down well around the edges and make sure it is well sealed. Brush the top with non-dairy milk. Make a small incision in the middle to let trapped air escape while cooking. Bake on 425°F for 40 - 50 minutes until the pastry is golden brown and the filling is soft when you insert a knife into it..
You may need to adjust the amount of water slightly as all flours have different absorbencies. Start by adding 9 tablespoons and see how you go. Add the remainder very gradually until you have a smooth, pliable dough.